1 Praise the Lord . 3 From the rising of the sun to the place where it sets, the name of the Lord is to be praised. Not specified in the text. The volcano in my picture is spewing out ash & dust, which is blocking the sunlight from reaching the scene. Nevertheless there is a general illumination from above. a woman in the dust. Psalm 113 is an example of a Hymn, which lift the congregations praise to God, describing God’s greatness & majesty. This scene came to me when I was studying this Psalm. It is a literal depiction relating to ash & dust. I often think of volcanoes when ash & dust is mentioned! I enjoyed drawing the erupting mountain. I decided to use a very limited palette, mostly greys & greens for this scene. 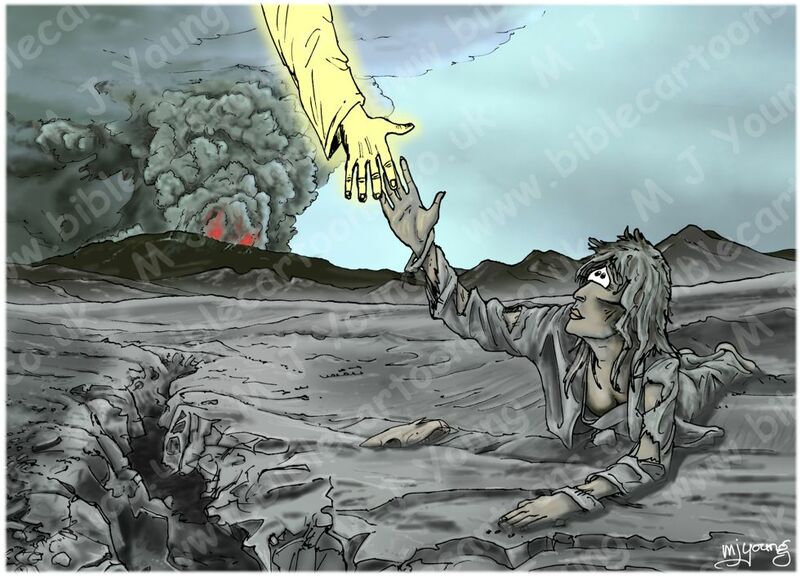 The only other colour comes from the red volcano’s mouth & the yellow glow of the arm of the Lord God, reaching down to help the woman in the ash & dust. I have given her a little skin colour, to enable the viewer to see her a little better. Notice the skull of a creature to the left of the woman’s prostrate body. It is based on a horse skull, though I have drawn it much smaller so as not to dominate the viewer’s attention.